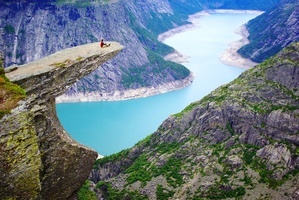 Norwegian Fjords and Coastline – A great way to explore the most famous fjords of Norway, as well as the 3 largest cities and the Norwegian Coastal Voyage. Arrive in Oslo. Free day to relax and explore Norway's capital. 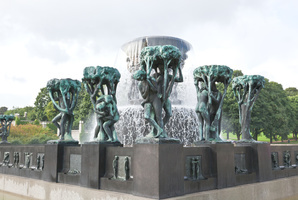 Visit famous landmarks such as the Viking Ship museum, The Vigeland Sculpture Park, and the Holmenkollen Ski Museum. Overnight in Oslo at a centrally located hotel. Walk from your hotel in Oslo a short distance to the Main rail station, next to the Opera House. 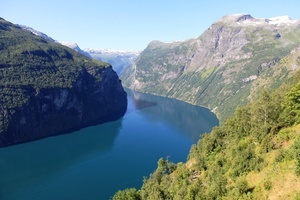 Depart Oslo on a scenic train ride, passing towns and farm country as well as the highest point on the railway, Finse at 1222 meters above sea level. When you arrive at Myrdal you need to change trains, boarding the famous, Flåm railway, an engeneering marvel winding it’s way down to the picturesque village of Flåm. At one of the stops you can get off the train to take pictures of the waterfall above. Arriving in Flåm, it is a very short walk from the train to the boat for a cruise out the Aurlandsfjord and in through the Nærøyfjord to the little town of Gudvangen, These fjords are spectacular, very narrow with steep mountains on all sides. In Gudvangen you board the bus that takes you up the many hairpin turns to Stalheim before reaching Voss. In Voss you leave the bus at the rail station board the train to Bergen. Overnight in Bergen. Spend the day exploring this enchanting maritime city. 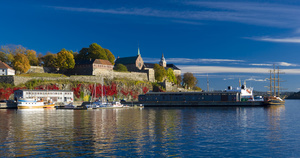 Take a city tour and enjoy Hanseatic Wharf at Bryggen, St. Mary's Church, Korskirken Church, The Rosenkrantz Tower. 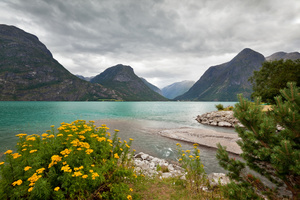 Visit the famous Fish & Flower Market or ride on the Bergen Funicular to Mt. Fløien for panoramic views of the city and fjord far below. Overnight in Bergen. Spend most of the day free in Bergen before departing on the Coastal Voyage at 8:00 p.m. Spend overnight onboard in an outside cabin, watching the coastline and passing all the little islands as you travel north. Spend the day onboard the Coastal Voyage ship as it travels southeast into the famous Geirangerfjord. Carved by huge glaciers the fjords can only be truly appreciated from the water. You will be amazed by mighty mountains towering over the narrow waterways and the scenery will leave lasting memories of your visit to the area. The ship will turn around at the innermost part of the Geirangerfjord before continuing the cruise to the charming city of Molde. Overnight onboard in an outside cabin. Arrive in Trondheim at 8:15 a.m. Spend the day at you leisure exploring this historic city with its famous Nidarosdomen cathedral, or visit the Ringve museum of musical instruments. Walk through town crossing the Old Town Bridge to Bakklandet, a community of old, original wooden buildings and small sidewalk cafes. Trondheim has a rich history dating back to the Vikings. Overnight in Trondheim. Walk from your hotel to the rail station for a beautiful 6.5 hour train ride to Oslo. The train climbs from sea level up through the Dovrefjell National Park to the Dovre mountains, before descending down the Gudbrandsdal valley with the Rondane National Park on one side and the Jotunheimen National Park on the other side.You will pass the Olympic town of Lillehammer before arriving in Oslo in the afternoon. End of tour. Rail from Trondheim to Oslo with seat reservation.